Bon anniversaire à mon fiston et à ma tante! Quelle magnifique journée! Christina et moi vous accueillons à notre 45e Inventory Challenge. Notre thème: les fées. J,adore les dessins de Mo Manning, et j'ai choisi Birthday Fairy Lee pour ma carte. En me cherchant une mise en page, je suis tombée sur la carte de Bev Rochester et je n,ai pu m,empêcher de m'en inspirer. Voici donc ma version, avec mes petites touches personnelles. Encore une fois, j'ai fait des petites feuilles en rocailles, ne sont-elles pas mignonnes? J'ai colorié Birthday Fairy au Copic, avec touche de Prismacolor, après mon expérience noir et blanc, quel plaisir de colorier en rose. J'ai embossé les ailes et le crémage du cupcake, et j'ai ajouté du glitter. 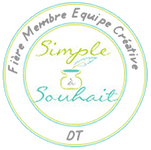 Derrière mon image, j'ai glissé un doily, coupé avec mon premier Marianne Creatables, (disponible chez Scrapbook ta vie), j'en ai 2 en commande. Ils sont super beaux. Thank you for your visit, please take a moment to visit my dear friend Christina and our dear team mates, to admire there wonderful creations. Cathy Lynn is undergoing major works in her house, another kind of challege for her, (Hi! Cathy) Next week, our theme will be "trees"... Until the next time, have a wonderful weekend. MErci de votre visite, je vous invite à visiter mon amie Christina, et nos coéquipières ; vous découvrirez certainement de magnifiques créations. Cathy-Lynn est en pleine rénovation, un autre défi l'attend! La semaine prochaine notre thème sera: les arbres. Good Morning Danielle! I am up really early and now I know why. Because I knew this pretty pink card was waiting for me. Your papers are beautiful - the image cute as a button and colored beautifully. Those leave are so pretty they look like flowers! A piece of artwork for sure! Elle est magnifique, j'adore quand tu mets tes petites feuilles. Bravo! WOW!!! 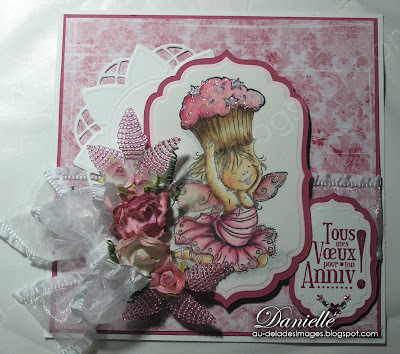 I am speechless.. this is one gorgeous card Danielle. Your coloring is fantastic and so are your choice of elements for this card. OMG....this is soooo magical!!!!! What a beautiful creation...gorgeous coloring of this adorable fairy and you showcased this cutie to perfection. WOW....LOVING THOSE STUNNING BEADED LEAVES!!!!!! Danielle your card is amazing I love that little image and you have colored her to perfection. Ta carte est magnifique! j'adore ta coloration et ça fait tout un effet avec les ajouts de prismacolor. bravo! 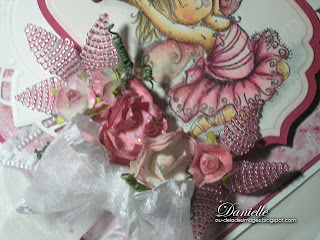 Stunning card Danielle, I adore the image and how beautifully you've coloured it! Your attention to detail is fantastic too! Thanks for entering our 'Lots of....' challenge at Fussy and Fancy this week and good luck! Isn't she ADORABLE?!?! What a darling image! Lovely! And I know how you feel about cupcakes! cela fait longtemps que je ne suis pas passée te voir.... cette carte est fabuleuse... rose elle ne pouvait que me plaire. et ton coloriage est FANTASTIQUE!! Pour l,avoir vue en vrai je sais qu,elle est super belle! Ton petit bouquet floral est parfait! Bravo ma belle! Danielle! She is just too cute. Love the beaded leaves and flowers you used. Love that Marianne Designs die too! Very, very nice! Oh, wow, Dani! This card is spectacular! The image is so adorable and so beautifully colored - Oh I love all the pink you have used. Your flowers, beaded leaves and beautiful bow are wonderful supportive of the sweet image! Fantastico! Oh my goodness gracious! danielle! this is soooooOoo STUNNING! Your colouring is amazing! And that flower cluster is just sooOoo dreamily divine! Those cone shaped thingy's are BEAUTIFUL!!!!! I love this!!! Happy Birthday to your son and aunt!!! Gorgeous card Danielle!! 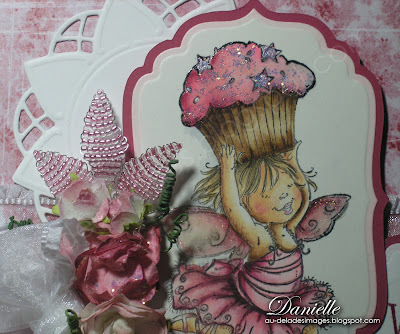 I love the image, great coloring and the pretty embellies :) Thanks for sharing it with us at The Pixie Cottage this week. This is so adorable and Fabulous!!! 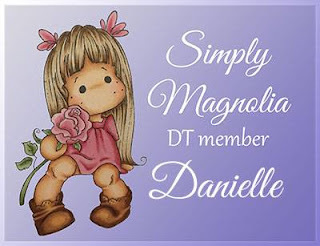 !Another gorgeous creation Danielle!!!!! Way to go!!!! Ce qu'elle est jolie cette carte! Ton coloriage est des plus réussi encore une fois! J'adore ce petit bouquet...avec ce feuillage original!!! Beautiful card, and adorable image! I've made those beaded leaves, just never thought to use them on a card - fabulous idea! Thanks for joining us at The Pixie Cottage! oh my!! This is stunning!! I love what you did. The colors look fantastic and the beaded leaves are just to die for!!! I can't wait to see more of these! Wow, Danielle! What I've been missing! This is surely a work of art! Love this Mo Manning image, well, I love them all, but this is one of my favorite! Your coloring is simply awesome and those beaded leves look like flowers to me. Amazing card, just adore it! Danielle, stunningly gorgeous. I love this adorable fairy image (I have the digi!) --she's beautifully coloured. Your colouring is awesome. Love the shaded areas--I have to learn to make mine deeper in colour. Love those beaded leaves of yours--haven't seen those anywhere else. Love your card--so beautifully put together.